Wells Fargo’s deep and rich history gives us the opportunity and privilege of presenting free history museums to our many communities. 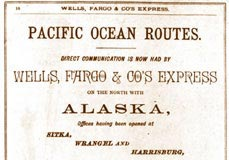 Each museum presents Wells Fargo’s unique role in the growth of America and its area. You can see original stagecoaches, banking and express documents, working telegraphs, western art, gold coins, old money, and more. Free tours are available for all ages, with a special emphasis complementing state primary and secondary American history curriculums. Students learn of and experience the role of gold in U.S. history, banking, communication, and of course, traveling west by stagecoach. The museums also tailor tours for senior groups, college students, and business professionals. Teachers and tour leaders should call ahead for details and to schedule a tour. All of our museums are free to the public. For locations, hours, and contact information, select a city from the list below. The Heritage Library and Museum, established in 1968 by the National Bank of Alaska, focuses on Alaskan history and cultures. It features an extensive collection of Alaska Native artifacts, fine art by Alaskan artists, and a 2,600 volume reference library of books on Alaska subjects. 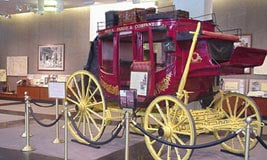 Exhibits and a three-quarter size stagecoach present Wells Fargo’s role in the Alaskan Gold Rush. Please contact the museum to schedule tours. 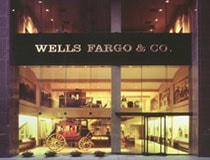 The Wells Fargo History Museum is adjacent to Levine Center for the Arts in Three Wells Fargo. This museum highlights gold mining in North Carolina, the beginnings of Wachovia, and Wells Fargo history. The newest Wells Fargo History Museum, in downtown Des Moines, highlights Iowa’s role in connecting the nation. Iowans also helped shape financial services we know today: banking, credit, and mortgage. 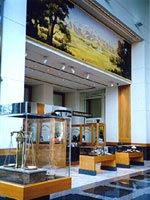 In the Wells Fargo Center on Bunker Hill in downtown Los Angeles, this museum highlights the Company’s role in Southern California. Exhibits include an original Concord coach, gold (including the 26-ounce Challenge Nugget), a panoramic painting of Los Angeles in 1859, a historically recreated agent’s office, and the story of Wells Fargo and Hollywood. 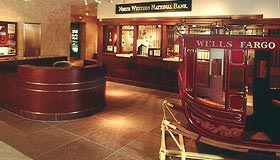 On the Skyway level of the Cesar Pelli designed tower, Wells Fargo presents its Midwestern heritage, a Concord coach, mining and milling along the Mississippi, the vintage Town Bank, and Northwestern National Bank's Weatherball. Located in a historic 1928 Beaux-Arts building, the newest Wells Fargo History Museum connects the California gold rush with the Philadelphia Mint, tying together the history of Wells Fargo and the rich heritage of the eastern United States. 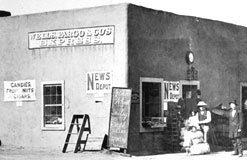 From 1858 on the stagecoaches of Butterfield’s stageline, through wild days at Tombstone, to extensive railroad service to the mines, Wells Fargo’s history in Arizona is classic western history. Unique to this museum is the art gallery featuring western-themed works by famed illustrator N.C. Wyeth. In the Wells Fargo Center tower, next to City Hall, in downtown Portland, explore the roles both Wells Fargo and Oregon played in each other’s history, from the Cal-Oregon Stageline, to riverboats of gold on the Columbia River, to banking and express for Oregon’s communities. NOTE: Our Portland Museum will be temporarily closed for renovations beginning August 11, 2018 through May 1, 2019. We have two museum locations in Sacramento; inside the magnificent five-story atrium of Wells Fargo Center downtown and in the historic Hastings building in Sacramento Old Town where Wells Fargo opened its second express and banking office in 1852. In Old Town San Diego State Park, visit a historically furnished Wells Fargo agent’s office. Exhibits include one of the famous 30 coaches shipped to Wells Fargo in 1867, a panoramic painting of San Diego in 1855, and a gold watch given as reward for care of San Diego treasure on a stagecoach. On the site where Wells Fargo first opened for business in 1852, this museum features a Wells Fargo stagecoach that carried passengers and gold across the western plains, an impressive display of gold dust and ore from California’s Gold Country, and a special collection of Gold Rush letters carried by hundreds of express companies.